WASHINGTON, D.C., Apr. 14 /CSRwire/ - FedEx Corp. and the National Fish and Wildlife Foundation (NFWF) announced today the six local projects selected to receive funding and FedEx team member volunteer support in 2010 through a unique collaboration to address the most pressing urban environmental challenges in major U.S. cities. Grants will be award to local nonprofits in Los Angeles, Memphis, New York City, Pittsburgh, San Francisco and Washington, D.C. that will maximize FedEx philanthropic and volunteer resources to improve air and water quality and enhance urban community spaces. "As a global company, with a significant portion of our operations, people and facilities based in metropolitan centers, we highly value healthy urban spaces," said Mitch Jackson, vice president, environmental affairs and sustainability, FedEx Corp. "Our work with NFWF offers a unique opportunity for our team members to work directly with local nonprofits to improve the urban spaces that we share with the communities where we live and work. We congratulate the six community groups that were selected to receive 2010 grants." "At the National Fish and Wildlife Foundation we believe that collaboration with innovative global leaders like FedEx Corp., as well as local grassroots conservation organizations, is key to tackling some of our nation's most pressing conservation challenges," said Jeff Trandahl, the National Fish and Wildlife Foundation's executive director. During the next three weeks, FedEx team members will participate in a day of service with NFWF's grant recipients to help clean the Los Angeles River, plant trees in Memphis and Pittsburgh, mentor youth while building a green roof on Randall's Island in New York City, convert a condemned nursery into a LEED-certified facility in San Francisco, and develop an outdoor-living classroom in Washington, D.C.
"Urban conservation is vital to the health and well being of city inhabitants," said Lynn Dwyer, northeast assistant director for the National Fish and Wildlife Foundation. "By developing green space and providing public access in densely populated areas, we are also helping to deliver a straightforward answer to modern day problems, such as pollution and energy usage." The FedEx contributions, ranging from $25,000 to $50,000 per project, will be implemented through NFWF's Five Star Restoration Program and the Long Island Sound Futures Fund. Funds from FedEx and NFWF will be significantly leveraged by support from federal and state government agencies, including the U.S. Environmental Protection Agency (EPA), as well as other private and non-profit partners, resulting in a four-to-one match. The FedEx commitment to NFWF is in support of FedEx EarthSmart Outreach, which is a focus area of EarthSmart - a FedEx commitment to deliver innovations to meet ambitious sustainability goals. EarthSmart Outreach is a program empowering FedEx and team members to contribute to the community in environmentally-focused ways. In 2011, FedEx will expand the collaboration with NFWF to include Boston, Chicago, Dallas, Indianapolis, Philadelphia and Seattle. Complete information on the FedEx and NFWF grants are available at www.nfwf.org/fedex. Project Description: Volunteers will participate in a river cleanup and support educational activities for River School Day, which provides hands-on educational experiences for 4th - 12th grade students along the banks of the Los Angeles River. Project Description: Volunteers will work with LL&W and Shelby Farms Park to plant, water, and mulch trees in containers to be replanted along the shorelines and islands of major waterways, as well as within towns and cities across as part of the Million Trees initiative. Project Description: The project will expand a "green roof" of shrubs, trees, grasses and rain barrels on Randall's Island to keep storm water from running off into the sewer system, to provide habitat for birds, and for educational purposes. Project Description: Efforts in conjunction with TreeVitalize Pittsburgh will help beautify a portion of the public Riverfront Trail along the Ohio River by planting trees. Project Description: The project will replace a condemned nursery building with a new LEED certified facility, the first element of a larger plan for a new Stewardship Center designed to enhance public use and enjoyment of the historic Presidio of San Francisco as a national park. Project Description: Volunteers will participate in an "outdoor-living classroom" program that will help to teach gardening, build community service skills, provide wildlife habitat and put students and teachers in touch with the natural environment. FedEx is committed to connecting the world responsibly and resourcefully. We have set long-term goals to reduce aircraft emissions 20 percent by 2020, increase FedEx Express vehicle efficiency by 20 percent by 2020, and expand on-site renewable energy generation and procurement of renewable energy credits. FedEx works to achieve these ambitious goals through EarthSmart -- the FedEx roadmap for operating in an increasingly sustainable way and engaging our team members, customers, business partners, and the circle of influencer communities to help us reduce the environmental impact of our daily business operations. 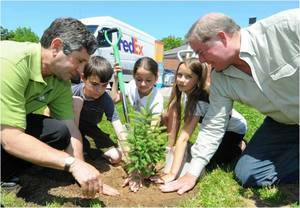 FedEx has been recognized for its sustainability commitment through inclusion in the Dow Jones Sustainability Index -- a global list of the world's largest, most sustainable organizations -- and ranks #93 in Newsweek's 2009 Top 500 Greenest Companies. FedEx Corp. (NYSE: FDX) provides customers and businesses worldwide with a broad portfolio of transportation, e-commerce and business services. With annual revenues of $33 billion, the company offers integrated business applications through operating companies competing collectively and managed collaboratively, under the respected FedEx brand. Consistently ranked among the world's most admired and trusted employers, FedEx inspires its more than 280,000 team members to remain "absolutely, positively" focused on safety, the highest ethical and professional standards and the needs of their customers and communities. For more information, visit news.fedex.com. The National Fish and Wildlife Foundation is an independent conservation leader that in 25 years has awarded 10,800 grants to more than 3,700 organizations. By building partnerships, the congressionally chartered Foundation has leveraged $680 million into $1.6 billion to sustain, restore and enhance fish, wildlife and plant populations. For more information, visit www.nfwf.org.